Decreased appetite and fevers typically go hand-in-hand, and your goal during the course of your toddler's fever will be to get him to eat and drink as best as possible. By offering him their favorite foods, encouraging fluid intake and providing vitamin-packed fruits and vegetables, you can help your toddler fight off infection. If a fever is your child's only symptom, he will likely be able to eat a normal diet. Most children who are suffering from a fever will have a decreased appetite, so you may need to offer them several small meals over the course of the day. Offer foods that are not too heavy, oily or spicy. 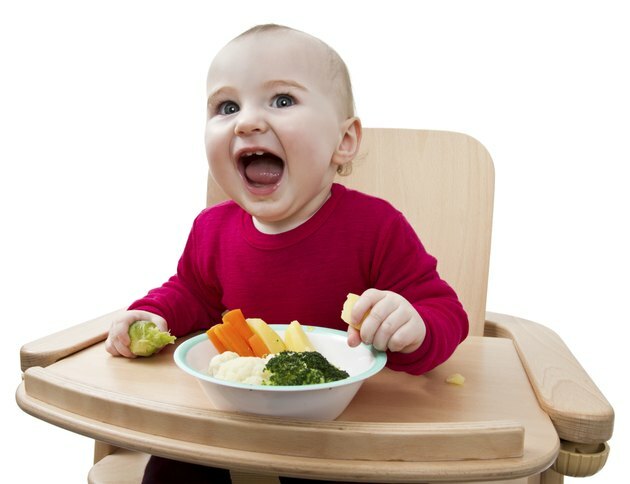 Your best bet is to offer toddler-friendly foods that are easy to digest such as mashed potatoes, noodles or rice. These foods are typically high in calories, which your toddler will need to help fuel his body to fight off infection. Parents have served chicken soup as a remedy for illness for decades, and it turns out scientific evidence actually backs up the age-old claims. Scientists have determined that the combination of chicken, broth and nutritious vegetables found in chicken soup can have a healing effect on the body, reports Natural News. Chicken soup has also been shown to decrease inflammation in the body by inhibiting the production of white blood cells. The warmth of the soup may also have a comforting and soothing effect on your sick child. Fruits and vegetables are packed full of vitamins that will greatly benefit your child while he battles the source of fever. Try fruits that are high in antioxidant vitamin C, such as oranges and other citrus fruits. Vitamin C is helpful in supporting immune function. Carrots are a good food choice for toddlers battling infection, as they provide beta-carotene. The body converts beta-carotene to vitamin A, which in turn, helps support white cells in their battle against bacteria and viruses. Encouraging your toddler to drink plenty of fluids is extremely important when he is suffering from a fever. The body can quickly become dehydrated, especially if the fever is accompanied by diarrhea or vomiting. Offer your toddler fluids frequently throughout the day, aiming for 1 or 2 oz. every half hour. Fluids such as water, electrolyte beverages, warm broth and ice pops are all good choices. Keep a close eye on your toddler's fluid intake, and be sure to notify his pediatrician if he is not drinking enough or is unable to keep fluids down. What Foods Can Be Offered to Babies With a Fever?